First off, I have to say I'm totally loving the changes and additions Masterbooks has made recently. From an easier to navigate site to curriculum packages - they are quickly rising to the top of many homeschooling Momma's must haves. Of course I've been using MB curriculum for the last few years and I'm happy to see the growth of this company and products. They really do provide budget friendly options with Christian content. This is my first year teaching kindergarten. I'm equally excited and nervous. There is so much I want my little guy to learn plus I want to provide a firm foundation for loving school time and loving the Lord. I'm so excited to share a look at the new kindergarten package - Biblical Basics Kindergarten Set. CREATION: This book is the foundation of our kindergarten program. Young learners discover Creation with integrated, fun-filled lessons! Each set of instructions include math, English, science, art, and character studies. Key Bible verses link creation-themed concepts to the imaginative and fun activities. THE NOT SO SUPER SKYSCRAPER: Did you know that the Bible answers the big questions of life? The Not so Super Skyscraper is an entertaining and zany rhyming book that tells kids the real story of the Tower of Babel. Find out why everyone on earth is actually related and how different nationalities came to be. 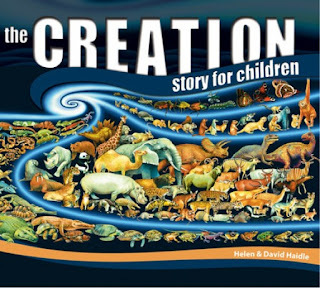 CREATION STORY FOR CHILDREN: “In the beginning, God created”...with these words, the Bible powerfully sets in motion our praise to the Creator for His awesome work. Written and illustrated by David and Helen Haidle, The Creation Story for Children is filled with vibrant images of the week of Creation. BIBLICAL BASICS TEACHER GUIDE: Students will study math, science, language arts, and art in this hands-on, delightful course. Lessons include singing songs, Scripture memory, fun activities, and character connections. Wrap up the year with a wonderful selection of children’s books that reinforce the creation message. Not only does the teacher’s guide provide an easy-to-use daily calendar, but also includes The Big Book, Bombus the Bumblebee, The Day the World Went Wacky, and Noah’s Floating Animal Park! This is a fairly complete curriculum. By studying and using all the components you will cover all the major subjects. I personally would recommend adding a good phonics and a solid math curriculum to go along with this grouping. (Masterbooks has options for both of these subjects - phonics & math). One of the things I like about this set is that the Teacher's Guide has just about everything you need. There is a schedule to tell you what to do each day with daily lessons. 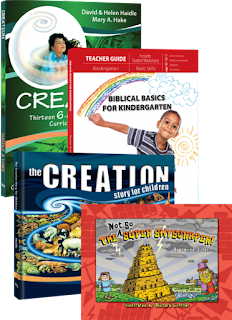 The Creation book has lesson plans also and the two combine together to create the bulk of the course load. We have worked through a bit of the book to get a feel for it and another bonus is that most of the hands on items are normal things found around the house. Like crayons, dark paper and a flashlight. I didn't have to buy a thing to jump right in. Scripture memory is included and I really liked that aspect. This is a sweet start to learning with a firm biblical foundation. By starting at Creation you truly are starting at the beginning.